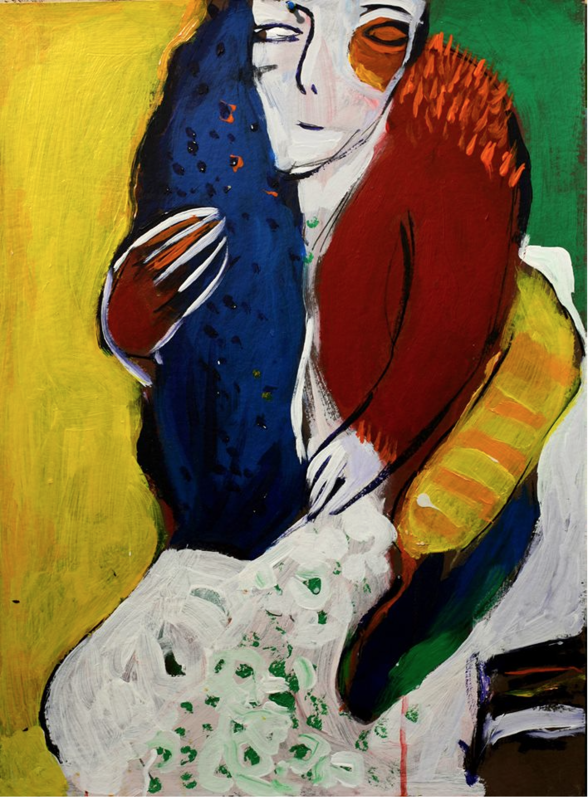 Original acrylic on cardboard artwork, “Seated Woman” (2016, 70 x 50 cm), by Palestinian artist Mohammad Khalil. Mohammad Khalil was born in Jordan in 1960. He completed his MA degree in 1988 at the Art Academy of Dresden, Germany. After graduation, he headed back to Damascus where he displayed his first show at Naji Al-Ali Art Gallery. After his exposition, he made his way to Nicosia for work. During his stay in Nicosia, Mohammad was able to participate in several group exhibitions. Through his experience he was able to develop his own style of art that enabled him to set up several solo exhibitions. In 1994, He returned back to his homeland Palestine. Since then, he has participated in local and international exhibitions. His most valued award is the Jury Prize from the 2000 Biennale of Alexandria. Currently, Mohammed lives in Ramallah where he works as the art director of the Palestinian Ministry of Culture.